We live in an electronic age. And while it is somewhat irritating to watch someone chat away on a cell phone while floating a remote river in Montana, as they say, times do change. And so it is not surprising that with the flood of electronics has come dry bags specifically designed for electronic items. 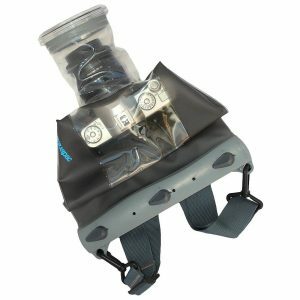 The purpose of this page is to provide a quick and simple overview of the different types of “100% waterproof enclosures” available for the multitude of electronic items people take on float trips today. 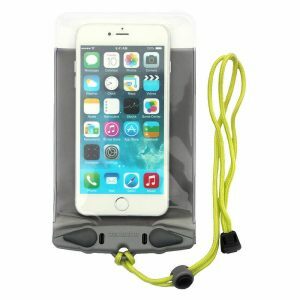 NRS Smartphone Waterproof Case. Perfect for float and fishing trips. See more phone cases at NRS. Waterproof phone cases are designed for, as the name suggests, smartphones. These are more than just a “waterproof case,” however. These phone cases allow for almost full-functionality of the phone. You can swipe/touch/pinch and turn the device on and off. These phone cases are thus ideal for people who need to use their phone while out on the water. So why would you want to use a phone while kayaking, rafting or canoeing? Well, there’s always the obvious, which is to receive calls from home or to call if plans change. Less obvious but likely of far more importance is that today’s smartphones, when loaded up with the rights apps and maps, are the perfect companion for people on long, overnight float trips in remote areas. The combination of phones + apps allows paddlers to know precisely where they are at anytime, thus avoiding the problem of trying to find campgrounds, take-in spots or portages. In short, there’s plenty of reasons to use a phone while on a float trip beyond checking Facebook and Twitter. When shopping for phone cases, be sure to get one that’s large enough. These cases come in a wide variety of sizes, so it’s easy to get one that’s too small. Tablet waterproof cases are simply larger versions of smartphone cases. They are designed to fit various size tablets, from kindles to full size iPad’s or iPad Pro’s. Once again, be sure to check the measurements of the case to avoid getting one that is too big or too small. A DSLR camera case allows for full use of the camera in wet conditions. 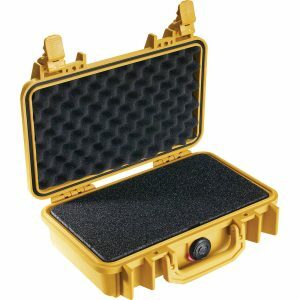 DSLR camera cases are soft-sided cases that fit a DSLR and allow near to full functionality of the camera. These cases have a crystal-clear acrylic seal at the location where the camera lens rests, allowing for crisp photographs. While these camera cases aren’t meant for “underwater photography,” they generally can be used to take photos a few feet beneath the water. Be sure to read the specifications of the camera case which will list how “deep” these cases may be used before running into problems of leaks. Cases for smaller, pocket-sized cameras are also available, too. A Waterproof Padded Dry Box. Ideal for laptops, DSLR’s and other large electronic items. View more dry boxes at NRS. Waterproof dry boxes are meant for larger electronic items, such as laptops, video cameras and DSLR’s. These boxes have extensive padding inside them to cushion the electronics from the rigors often encountered when running rapids or camping. These waterproof boxes are made from a tough plastic that you can stand or sit on. A rubber gasket along the inner lip of the case seals out the water. Waterproof boxes come in a wide variety of sizes. Some are “micro” sized and are meant to hold a single phone. Others are nearly luggage sized and meant to hold multiple cameras and laptops. The one downfall with waterproof boxes is that they are rather bulky. Being a box, they are thus hard-sided. They can’t be stuffed into the nooks or crannies of an inflatable kayak, hard-shell kayak or a smaller raft. Because of their bulk, most people who buy a waterproof box tend to use larger boats, such as whitewater rafts, larger recreational rafts or canoes. Waterproof boxes aren’t easy to find offline, and even online they are tough to track down. NRS has one of the best selections and only sells quality boxes that are tough, durable and won’t leak at the first hint of water.